Every year the seniors of Libertyville High School have a theme for the first day of school. This year we did a camo theme and packed our cars the first morning of school with hundreds of water balloons to throw at freshman. However, it turns out, if a school official discovers your parking lot plans you’ll be forced into the field. And you’re only allowed to throw the balloons at fellow seniors…uhm…..what? I did not sign up for that, no I did not. Lastly I had gym, and by then my stomach was grumbling. It was a person. And an angry one at that. It was time to eat. But seniors have lunch release which means that I get to go home. But to what? After eating at Grace Restaurant in Chicago two nights ago, I’m going to be living the broke life for the next month. So that meant I wouldn’t be eating out either. When I got home I found six or seven fresh zucchini from our garden on the kitchen island. Instead of the cheeseburger and fries I’d wanted, I ended up having leftover steak on a piece of garlic toast with a side of zucchini fries. 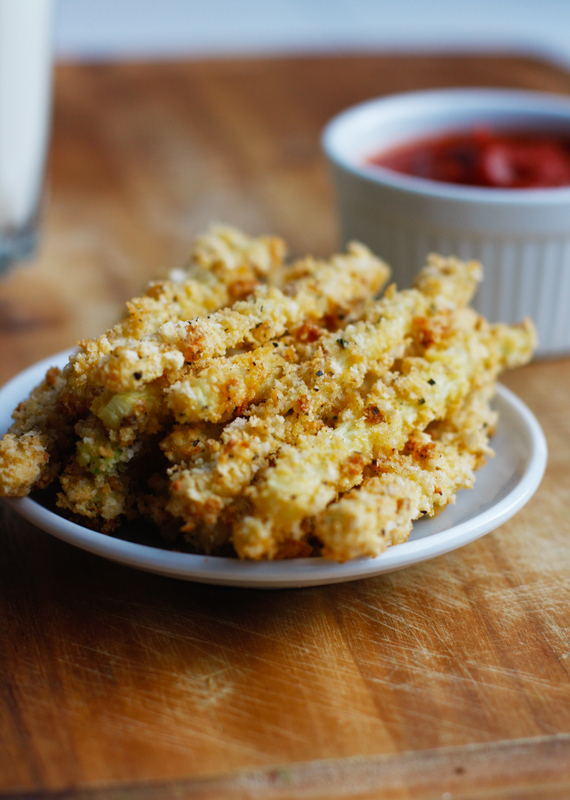 And it turns out, zucchini fries are baked, healthy, fast, and way better than regular fries. Try them out! This is a great use for over-grown zucchini in your garden. 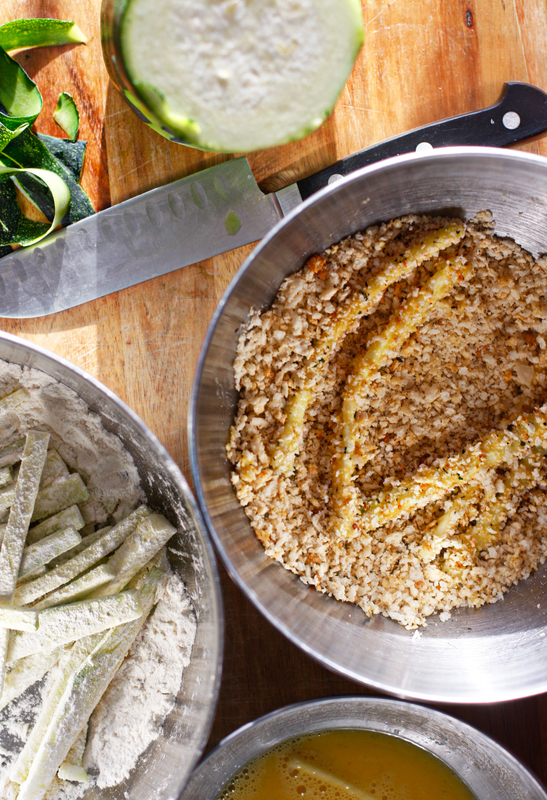 Over-grown zucchini tends to be drier and you can get a thicker cut without seeds! My 6 year old brother is so not about the-vegetable-life and he destroyed his plate of veggie fries. So here’s to a great use for over-grown zucchini, grumpy deans, and the start of our last year of high school! Crack 3 eggs into a separate bowl and beat. Add 4T of water, and beat again. Set aside. 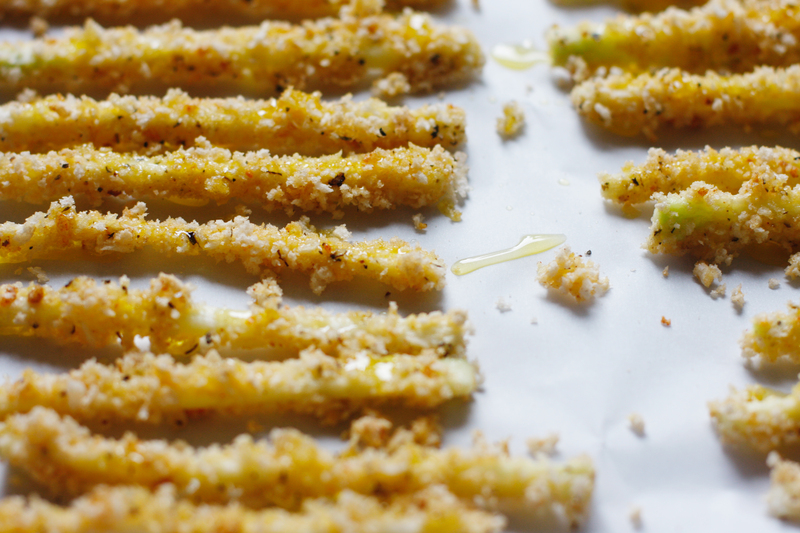 Pour Olive oil into a small ramekin, set aside. Toss the fries ( a few at a time ) in the flour, then into the egg mixture, and then into the bread crumbs, transfer to your baking sheet. When sheet trays are full bake 15-20 minutes, or until your fries are golden brown. Sprinkle salt over the fries to taste. Serve with marinara or spaghetti sauce.